The Long Jing green tea garden in Yang Mei Ling village close to Hangzhou was the very first tea origin place had visited in my life. Therefore it felt very special to me, when I was taking this tour. How did I find about about that Long Jing tea plantation? There was a little bit of research necessary to find a guide and the right tour program, that would give me a good introduction to this very famous tea cultivation region and to also give me some first hand insights on the people that actually work on these plantations. Luckily my online research helped me to discover Shanghaiandbeyond.com. Its a website that focusses on guided tours for tourists through Shanghai and surroundings. I read a customer review about the tea tours they do and after that it felt as just the right thing to book, so I made my reservation. Distance from Shanghai to green tea garden in Hangzhou area. The tea plantation was located close to Hangzhou, about 90 minutes away by train from Shanghai. Hangzhou is a fair bit smaller than Shanghai, but still counts several million people its inhabitants. Twice as many people as in Berlin live in this city – remarkable. In the morning I met with Tracy and around 10 more people at the central train station in Shanghai. We were handed our tickets and soon went on the train. Time passed by quickly, I had many questions I had to ask Tracy. 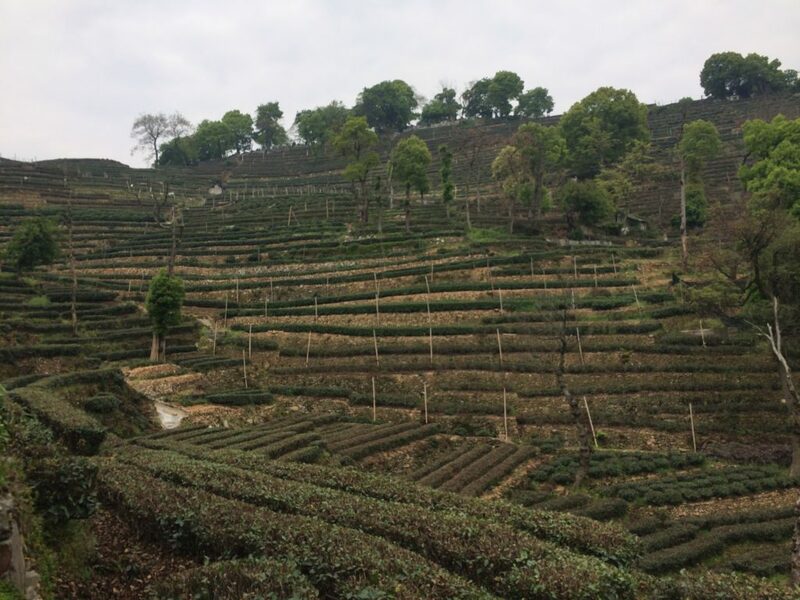 Once we arrived in Hangzhou, we took a bus and drove probably for another 30 minutes to the outskirts of Hangzhou, where we would find the YanMeiLing tea plantation. This whole area around Hangzhou is very very famous in China for the tea that it produces. It is known for one specific kind of tea, which is called “LongJing Cha” in Mandarin, “Dragonwell Tea” in English and “Drachenbrunnen Tee” in German. This type of tea is considered a Green Tea and is without question the most famous and most liked green tea in China. Prices for good quality LongJing are always high. Tea from this region regularly wins national tea contest because of its wonderful nutty, still floral flavor. The tea leaves look absolutely mangnificent and are characterized by its flat needle like shape. Chinese emperors loved this tea also because of the Jade-like, silvery color of the leaves, which makes them look very precious and desirable. The name LongJing is very specific as you can see, when you read the English translation Dragonwell. And just like with a lot of names for teas in China, it goes back to a legend. In this legend a village, most likely in the Hangzhou area, was suffering from a heavy draught. People were very desperate and did not know what to do, as all their plants were dying. Rumors were spreading, that in one of the many wells around, there would be living a dragon. People saw it as their last chance to ask the dragon to please let it rain again. And it was a good dragon. Shortly after, the draught was washed away by heavy rain falls. People were happy again and the tea plants were growing and produced fresh new shoots. As a sign of gratefulness, the people named their tea “Dragonwell Tea”. When we arrived in YanMeiLing it was no comparison to the smoggy bad air in Hanghzhou. We went up to the surrounding hills of Hangzhou and those hills were full of beautiful old trees. The air was really fresh. 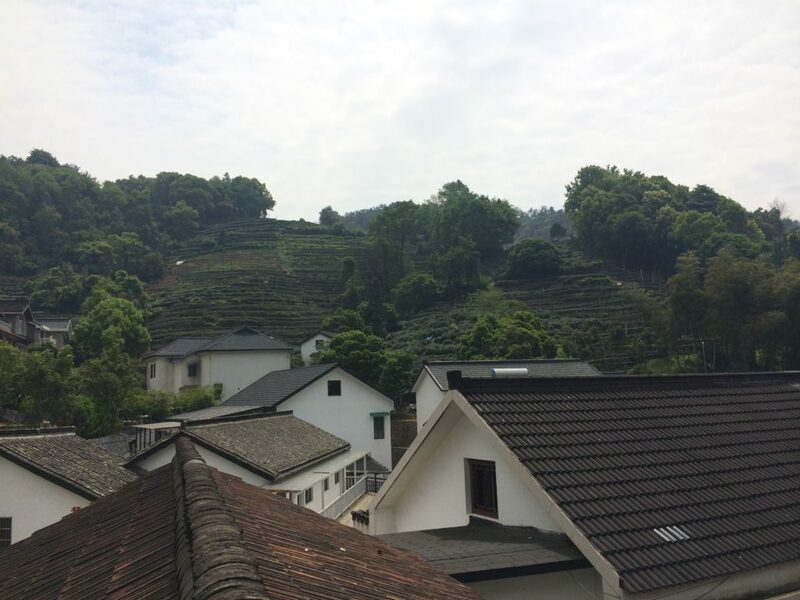 There would still not be any direct sunlight, but while in Hangzhou that results from the thick smog, here it would be because of the foggy, humid mountain climate – fantastic tea growing conditions. The less direct sunlight the better, because it makes the plants grow slower, which gives them more time to absorb nutrients from the soil and those lead to a richer flavor in the end. The YanMeiLing tea village was beautiful. It appeared to be quite old, the buildings were looking ancient, but seemed, to my surprise, in very good condition. The inner gardens of the village were carefully taken care off and I learned from Tracy, that this area actually hosts a lot of rich people. This great reputation of LongJing leads to the fact, that the tea growers can ask for a lot of money for their tea. And the tea is in demand, so money follows. We had the chance to leave our bags and backpacks in the village, to be light weighted when we walk up the the fields on the mountain slopes. 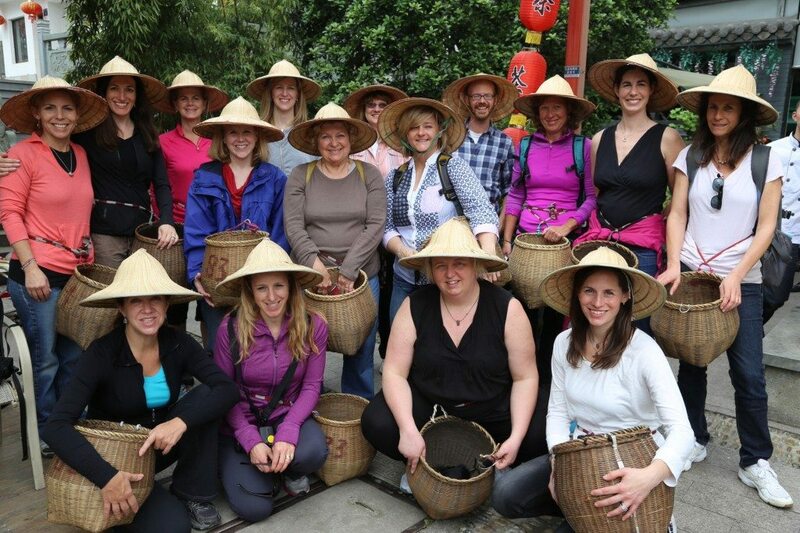 But before we did that we had to take a group photo in which we were all starring as traditional tea pickers with hats, baskets and everything. Highly cheesy, but a must-do and something that cant be avoided, everyone loved it. Am I really the only guy?! Getting up close to tea! Then it was time for some actual hiking. We went up the hills and passed by the many tea fields. It was just beyond harvest season, so most of the tea plants were cut back to regenerate. Still a little bit of picking would be going on, but nothing as big as compared to the peak season which would last 5 -6 weeks. Then a lot of other local tea farmers would help in the harvesting and additional laborers would be hired. For all you out there, who dont know better, but in the end only a little part of the tea plant actually get picked. Its the top leaf plus the two following ones. Those are the greenest part of the leaf and the one that tastes the freshest. Consequently a lot of picking has to be done to get a fair amount of leaves together. And even all our efforts combined only resulted in a handful of leaves we could use for further processing. Kudos to the real pickers! While wandering through the tea fields, me feeling very excited and happy about everything, Tracy and her partner Michael were providing us with information on the harvesting and many other tea related matters. I was listening closely and sucked it all in like a sponge. The landscape of it all was very beautiful to look at. We would look down from the mountains into the village of YanMeiLing, we would see its beautiful houses surrounded by so much green. We could see other mountains in the distance and long stretching tea plantations. During harvest season it must look even nicer with all the tea plants flourishing and not being cut. Hills of Long Jing tea garden in Yang Mei Ling. We went back to the village, had some outstanding local cuisine and then got to witness another highlight. 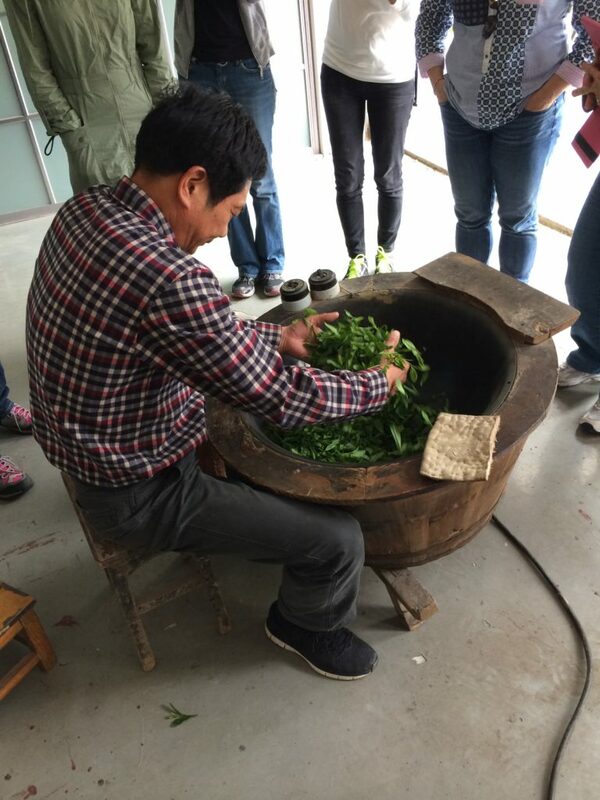 We were shown how LongJing tea gets processed after the leaves had been picked and had gone through several hours lasting withering stage. 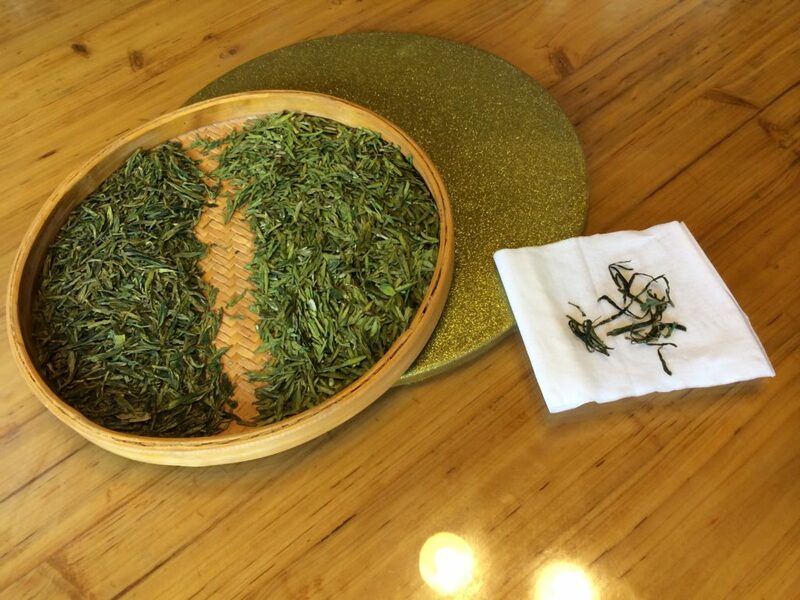 This part is crucial within the LongJing production process and the specific way it is being carrier out is another factor that distinguishes LongJing from all the other green teas. What now happend was the “wok-frying” of the leaves. The tea farmer would heat a wok, this one fuled by electricity and would work on the leaves for around 30 minutes. He would constantly stir them in the wok. But you could see that there was a certain technique involved. While he was just picking them up and let them fall through his hands in the beginning, he would switch to stirring them around in the hot wok after a while. You could see that he knew by the texture of the leaves, when was the right time to switch in the handling of the leaves. And in the end he switched to the most distinct part of LongJing making, he started to press down the leaves to the bottom of the wok. He would repeat doing that in regular intervals and the leaves would more and more make sizzling sounds, indicating that they are getting dry and ready. In the end the leaves had this flat, pointed shape. Rolling and heating the leaves at Long Jing tea garden. You need to have many years of experience to be able to do this job good. It is also the most responsible part in the tea production chain, because if you dont do it properly, the leaves will loose all their value. 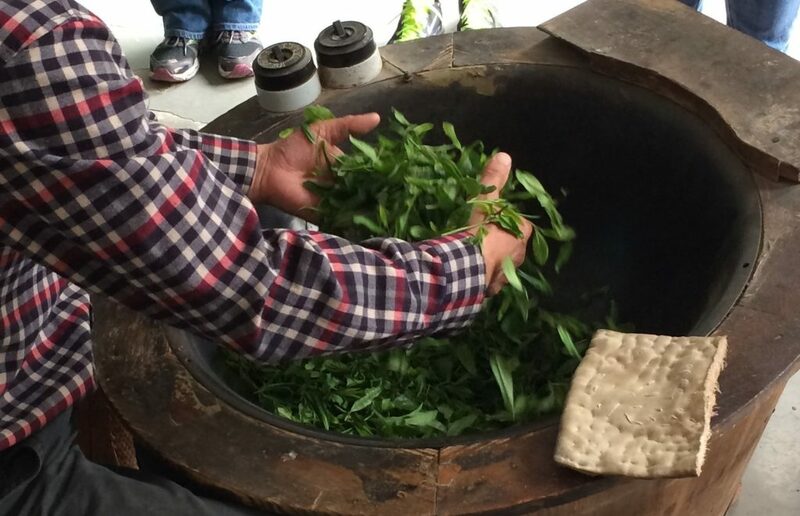 We could see that too when we compared properly processed LongJing leaves with leaves he let us do in the wok. It was two different worlds. When he let us use the wok, we could feel by ourselves how hot the wok becomes. When I did it I was so excited and gave it all my concentration so that I did not notice that I was burning my hands. Still days later parts of my palm would hurt and the skin loose of. Unfortunately the tea farmers have an issue with passing on their knowledge to next generations. The new G is simply not interested in this old thing and prefers to go to the city and do modern kind of work. To me this leaves one question open, though. If it really is a business with which you can make so much money, would that not be just such a big argument for tea, that would make the young generation reconsider their choice of work? In any way, after we have learned how LongJing tea gets produced, we finished off our day with actually tasting the LongJing tea. And we went one step further, we actually did a tasting competition and were supposed to taste differences between 1st year harvest and 2nd year harvest. The 1st happened at around late March, early April and the last one towards mid/late May. The 1st one is considered to be the better and fresher tasting one. So our whole group tried and most of them managed to guess right. It surprised me to realize that there would be such a big difference in taste and that we would actually be able to taste it. It started with the look, the 1st harvest was much greener and more yellow, while the 2nd harvest was more dark green. When it came to the flavor, then the 2nd harvest was much much more intense, took more room in your mouth, especially on the tongue, it left a big film of tannins behind (at least thats what it tasted like). Very strong and not as delicate as the 1st harvest. 1st harvest was more light, but it also gave more space for other aromas to come up. The very special nuttiness came through, a lot of people say its „chestnut“ what it reminds them of. But in the end everyone tastes something different and thats the wonderful thing about tea, that it can not be put into a box so easily. Even though in this group I was besides Tracy and Michael the only „real tea enthusiast“, the others were mostly tea newbies and more attracted by the general adventure than tea in itself, most of us ended up buying LongJing tea from the farmers. Obviously everybody enjoyed their teas very much. And its not a surprise. So many people have their first green tea at an occasion when it was not prepared properly. Meaning the servant put boiling water over the leaves and destroyed the whole flavor of the leaves or simply bad quality leaves were used. Green tea is the tea you have to be most careful with. But it is also very rewarding, when you take the time to prepare it right. Buying some of this quality stuff finished off a fantastic day for me. What more can you ask for as a tea lover, when you can claim that you went to one of the most known tea growing regions in China, to a place that grows Chinas most loved green tea and that you were given the lucky chance in the end of actually purchasing some of this precious stuff for a good price?